Almost a year ago China stopped their timely (and usually reasonably detailed) reporting of avian flu cases (see H7N9: No News Is . . . . Curious) and since that time we've had to rely primarily on sporadic provincial announcements, rare media reports, sparse WHO updates, and EOM epidemiological reports that are essentially devoid of detail. We're you to add up the H7N9, H5N1 & H5N6 reports we've seen officially mentioned for December you'd have a couple of H5N6 cases, and five H7N9 cases (3 of which were announced in the past four days). Today Sharon Sanders of FluTrackers has picked up China's NHFPC monthly epidemiology report of infectious diseases for December, where buried in the line list are two entries - one for H7N9 cases, and another for all other avian flu cases. Curiously, although we've had a WHO notification of two H5N6 cases with onsets in December, neither are listed. China reports ZERO (non-H7N9) avian flu cases in December. As for H7N9, they report 10 cases, and 3 fatalities for December. Presumably the 5 we already knew about (see FluTrackers H7N9 List), and 5 more that were never publicly reported. Where they occurred, the ages and genders, and any other epidemiological information is not provided. December 2015 (at 0:00 on December 1st 2015 to December 31st 24), the national (excluding Hong Kong, Macao and Taiwan, the same below) reported a total of 543,130 cases of legal infectious diseases, died 1858 people. Among them, the CPI infectious plague, cholera incidence and deaths have been reported. 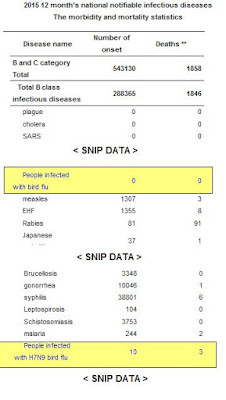 B infectious SARS, polio, highly pathogenic avian influenza and diphtheria morbidity, mortality report, the remaining 22 kinds of infectious diseases were reported incidence of 288,365 cases, 1846 people died. Before the reported incidence of five diseases were viral hepatitis, tuberculosis, syphilis, gonorrhea, and scarlet fever, accounting for 92% of the total reported cases of class B infectious diseases. Over the same period, the country reported a total of 254,765 cases of Class C infectious diseases, the death of 12 people. Where filariasis morbidity, mortality report, the number of reported incidence of the previous three diseases were hand, foot and mouth disease, other infectious diarrhea and mumps, accounting for 93% of the total reported cases of class C infectious diseases. No mention of Avian flu cases in the narrative, but the line list (which I've modified below), shows both items listed. While avian flu reporting remains disappointing out of China, they are hardly alone in this regard. As we discussed in Saturday's H7N9 Case Notifications In Drips & Drabs, we remain woefully uninformed on the world's two biggest avian flu hot spots (China & Egypt). And, as for much of the rest of the developing world, we don't know what we don't know.